It's been a difficult week, so to cheer myself up... I'm posting a wonderful dog-eared page from a November 2002 House & Garden. In that issue, H&G gave us a glimpse into Christian Louboutin's Egyptian hideaway. I absolutely love everything about this photo of Louboutin en route to his hideaway on a Nile ferry. 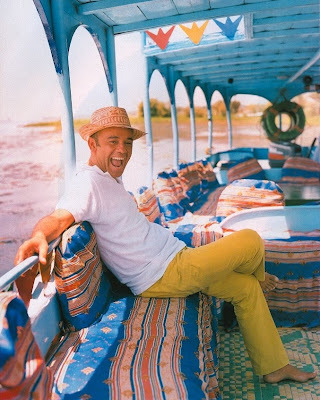 It's cheery and makes me want to go along for the ride—the blues, the boat, the hat, his yellow pants and smiling face... are all just perfect. I hope you like it, too! It's a great photo! I feel that all those vacant seats are for me. Lovely pic. I think he would be pretty hilarious company up the Nile, whether Agatha Christie style or just wearing some lovely heels. Absolutely, he would be great! I love everything about this photo. I just wish I knew who took it so I could source it! !